I get more questions about diet than anything else. People want to know if they should give up sugar, go paleo, fast, quit saturated fat or just eat whatever they want on the basis that it can’t make a whole lot of difference. In a world where it’s now possible to make a living out of giving other people dietary advice it’s difficult to sort fact from fiction. Most of the ‘evidence’ is anecdotal; this person quit sugar and has never felt better; that person ‘went paleo’ and beat their allergies. There’s no question that some of these people have achieved what seems to be better health by changing the way they eat, but have they reduced their risk of cancer? And how will we know what the longer term impact of these diets is likely to be without experimenting on ourselves? There’s also reasonable and serious concern about the ethics involved in research. Much of it is sponsored by organisations with a vested interest in the outcome and you’ve got to wade through the academic language to read it, or rely upon someone else’s often inaccurate interpretation. What to do? It may well be that excluding certain types of foods has a big impact on your health. Someone close to me recently tried the FODMAP protocol with the support of a dietician and discovered a fructose intolerance. Yes, that means she can’t eat apples! Just about every healthy diet I’ve ever seen includes apples but for her they’re a disaster. But even this site has nothing about intermittent fasting, which I believe is helping me to avoid recurrence and manage my weight. There’s also a problem with sites like this: It’s easy to become so overwhelmed with all of the advice that you just throw your hands in the air and break out the tim tams. While I have done everything I can to verify my choices using research I allow that future research might disprove anything I’ve read so far. I also allow that I have no way to verify the authenticity of any research. At some point you just have to decide to trust it. Also, I’m not a doctor. What works for me may not work for you. The two best measures of a diet are how well you feel on a day to day basis (this is fairly easy to determine) and how well you are over time (much more difficult). Diet is a major part of staying well but it is not the only factor. Please also consider your stress levels, your environmental exposure to things that may have a negative impact on your health, the quality of your sleep, the amount and type of exercise you get and the quality of the relationships you have with other people. These matter too. So here’s my current best advice for reducing the future risk of cancer and staying well. I hope it helps you to make some positive changes. A plant based diet consistently demonstrates a range of benefits to human health. Leafy greens are the only prebiotic proven to improve gut health and most of the food candidates for ensuring human health at a cellular level belong to this food group. Legumes show up as a major dietary component in every culture on earth that demonstrates unusual longevity. Fruits and vegetables are particularly important for forming healthy (non cancerous) cells, and for triggering the death of damaged (potentially cancerous) cells. Nuts and mushrooms are both returning impressive research results and most of us don’t eat enough of them. (Yes, I know fungi aren’t really plants but let’s put them in here anyway). It may be that your dietary intake of a particular micro nutrient is inadequate. In most cases that’s easy to fix. Add a food containing it to your diet. There seems to be a very relaxed attitude to supplements with most people considering them to be safe, but many can be toxic if you take too much of them and many can interact with medications in dangerous ways. You also need to be careful if you’re approaching surgery because a lot of popular supplements (e.g. fish oil) can cause excess bleeding. It’s almost impossible to get too much of a micro nutrient from food so if you think you’re lacking anything, try googling ‘natural sources of …….’ and improving your diet. Always discuss supplements with your doctor and when you’re asked ‘are you on any medication?’ make sure you disclose any regular supplements. We should be treating these pills with the same caution we apply to pharmaceuticals. Your doctor may prescribe a supplement as part of your recovery (particularly vitamin D) and you should make sure these are taken according to the dosage instructions. More is not better. I remain convinced that eating some animal protein each week is good for me, particularly for maintaining healthy levels of iron, B12 and essential amino acids. I’m also sure that I don’t need more that three or four serves a week. I’m also convinced that the profile of organically raised, grass fed meat is different and more nutritious than factory farmed and grain fed meat. There is research to support this view. Most of us still eat too much. Just eating less can have a positive impact on our health and survival. I suspect it’s actually healthy for us to be hungry some of the time but with the modern availability of food, most of us can reach for something the second we feel any hunger. A meal should leave you feeling pleasantly satisfied, not stuffed like a pillow. If you’ve been conditioned to eat everything on your plate then it’s time to recover from the notion that overeating is somehow virtuous. Sorry to say that the evidence for alcohol as a category one carcinogen is overwhelming. If you decide to drink then there is some evidence that resveratrol in red wine may help to reduce its carcinogenic impact, but you’d be better off eating red grapes or including some red wine vinegar in your diet and avoiding the wine. You may want to try some kind of protocol to determine if you have any food intolerances or you might prefer to just observe how you react to different foods. Either way it’s important to notice how you feel, and how your body reacts, after different types of food. Your bowels are a good indication of gut health and if you’re not seeing at least one well formed bowel movement every day your body is trying to tell you something. Same goes for bad breath, sallow skin, hives and rashes, acne and other physical symptoms. That’s not to say that all of these things are always caused by diet, but they may be. It’s also important to recognise that we are complex organisms and there are many different things affecting our body, including hormone levels, underlying health, regular medication and even the weather. I’ve met many people eating highly restrictive diets because they are certain they’ve had a reaction to something, once, a long time ago. A lot of self-diagnosed food intolerances aren’t real. The evidence for fasting having significant health benefits is, I think, compelling. It can lower human growth hormone (typically high in those at risk of cancer) and trigger cell autophagy (the body’s natural process for cleaning up damaged cells). I have two fast days each week where I eat only 500 calories as an evening meal. Apart from the milk in my morning coffee that’s all I have all day. I’ve also achieved a healthy weight using this method. Don’t fast without talking to your doctor first. It’s unsuitable for some people, particularly those on regular medication. It’s critical to the optimal function of your body and you can raise low blood pressure within minutes just by drinking water. This is an excellent demonstration of how important it is to stay well hydrated. I often see sites that say we are inclined to confuse thirst with hunger, but I think this misses the point. Our bodies aren’t mistaken. There’s really no difference between hunger and thirst because a lot of our moisture comes from our food. Our ancient ancestors didn’t carry drink bottles and probably got a lot of their moisture from food. This is another reason to eat fresh fruit and vegetables (they have a high water content) and to have a big drink of water before you eat a meal. Takeaway and eating out are both fine from time to time (and may well fall under stress reduction if you just can’t manage cooking), but if they’re a regular part of your week it’s likely you’re eating far too much sugar, saturated fat and salt. There’s also a much higher risk of overeating because we tend to eat the serving rather than paying attention to our appetites. My preference is to use organic ingredients at home whenever I can and to prepare them fairly simply. I also avoid most processed foods. The additives in processed foods appear to have a negative impact on the human gut. Processed foods are also typically higher in sugar and saturated fat than home cooked meals. I sometimes wonder how much damage we do to ourselves with food anxiety. On the one hand, it’s great to feel like we’re making a difference to our health by eating well. On the other hand, we can quickly descend into guilt and worry after a weekend pizza or a few hours on a nutrition website. I think food, and sharing food with friends and family, should be one of the great joys of our life. By paying attention to how I feel and how my body reacts to certain foods I’ve significantly reduced sugar and gluten in my diet and I eat well most of the time. I also enjoy eating out, eating takeaway, eating soft cheese and eating chocolate. Sometimes. Much less often than I used to. I’m still making improvements to my diet on a regular basis and doing some online research from time to time to see if there’s anything else I might add or subtract that will make a difference, but I’m not obsessive. I hope this short summary is useful. My final advice is to take a long view when it comes to fashionable diets. They have always been around. They will always be around. Very few of them have stood the test of time and I see no reason to expect that will change. Use one of them if it helps you to eat well but don’t feel pressured. The truth is that we still don’t know nearly enough about how the human body interacts with what we eat, but we do know that eating well can make a big difference to our health, so let’s just focus on that. Three years ago today my husband and I sat in a small office at Breast Screen with a doctor we’d never met and a counsellor I’d seen twice before to receive the news that I had triple negative breast cancer. I was pretty sure before the appointment that I was going to receive a cancer diagnosis. I’d seen the three (later four) suspicious cloudy blobs on the ultrasound and read the concerned face of the doctor taking the multiple biopsies. I’d cautiously and reluctantly read up on breast cancer but I’d never heard of triple negative breast cancer. I thought they’d tell me there was no urgency and that I had several weeks to think about what I wanted to do next. Instead the doctor asked if I had my usual doctor’s phone number on me so that I could get a referral to a surgeon as soon as possible. My father died of bladder cancer at 58. I used to imagine how odd it was going to be to reach 58 and realise I was now the age that Dad was when he died. Suddenly 58 felt like a worthy goal rather than a curious milestone. I was convinced that I was going to die. I wandered my garden sobbing. Not since my Dad’s death had anything been so upsetting. This was a kind of personal death. No more dancing through life as if it was going to stretch on and on for decades. No grandchildren. Perhaps not even being here for my daughter’s marriage. All of the joys of my future, suddenly squashed under the weight of a cancer diagnosis. In a cruel twist of timing, my daughter was in China at the time, holidaying with her Dad and his partner and the love of her life. We had already had days of painful discussion about whether or not to let her know that there concerns about my Breast Screen results or whether to wait until she came home. On the one hand, we didn’t want to spoil her holiday but with social media we knew that keeping it a secret was going to be impossible. My close friends were supporting me through the weeks of anxiety. (I still wonder why I didn’t just see my doctor and have the biopsy done privately! I would have had the results in days and not weeks. Shock.) Zoe was bound to pick up on the fact that something was wrong and to be very angry about not hearing the news before everyone else. So I made the hardest phone call of my life. With the experience of a police officer whose given death messages I told her plainly and quickly. There’s no point drawing this kind of conversation out. It just builds anxiety. Of course she wanted to get on a plane and of course I convinced her there was nothing she could do here. But how I wanted to hold her. It was a gift. I’d dug my own grave and was stretched out in the bottom of it. I was convinced that my father’s DNA, the stress of my previous occupation and the usual collection of unhealthy habits had collided.I was going to die. And then with one angry sentence my daughter turned me around. I climbed out of the hole and decided to fight. I decided to do everything I possibly could to beat cancer and to stay well. I spent hours on the internet researching triple negative breast cancer. I read books about cancer treatment and dealing with chronic illness. I started this blog. I hoped that writing about treatment would help me to stay on track (it did) and that perhaps sharing my experiences would benefit other women (it has). It can be difficult to find information about triple negative breast cancer that isn’t terrifying, so I also started a Facebook page and started sharing information about current research, along with small chunks of inspirational thinking that helped me to avoid falling into hopelessness. Back then I compared fighting cancer to climbing a mountain. I’ve got a better analogy. Cancer is like suddenly discovering that the path you’ve been walking on is unstable. It collapses beneath you and you slide, quickly and dangerously, down to the bottom of a deep, dark pit. On the way down you get injured. The extent to which you get injured is partly determined by how you handle the fall. The rest is luck. When you get to the bottom you have to make a decision: Stay and die or try to climb back out again. You know the climb will be long and difficult. You know there’s a risk you could back-slide, or wind up right back where you started. You don’t know whether to go back the way you came (because at least you know the risks) or to try climbing out using a different path. So many choices and none of them are clearly better. As you climb you find there are other people on the same journey. Some of them shout out advice to you but you don’t know if their progress is any better than yours. Some of them fall past you and you never see them again. Some days you feel like you’ve made great progress and other days you slide back towards the pit, terrified that the slide will go all the way to the bottom again. Your medical team fly in from time to time and drop supplies. Sometimes these make the climb easier and sometimes the weight of them makes you want to sit on the side of the slope and cry. Way up ahead, towards the light, you can see researchers building bridges and stairs. If only you can stay climbing long enough to reach them. More people slide past you on their way back down. You want to call out encouragement to them. You want to tell them not to give up and to climb and to keep climbing, but part of you knows that everyone has to make their own decision. There are no right answers. Finally the edge of the cliff seems within reach, but you’re so tired. This is when a lot of people give up. You know that. It looked closer than it really is. It seemed within a days reach but that was weeks ago. The people that love you are up there in the light, calling down to you. They’ve been there the whole time. Even when you couldn’t hear them. So you keep going. And then the ground starts to become less steep and your progress feels more certain. There are days when you can actually start to enjoy the scenery. Recovery seems possible, even likely, but you can’t trust it. You keep going. I don’t know when I made it over the edge of that cliff. Was it today? Was it a few months ago when my doctor ordered my three year scans early and I got the news I was cancer free? I don’t know. I feel as if I’m out of the pit now and back on solid ground. Life gets back to being about gardens and friends and good food and laughter. We talk about cancer as if it’s history. Once you’ve had that path drop out from under you it’s unlikely you’ll ever trust solid ground. It seemed safe the first time around, just before you fell into the pit. You know now what other people don’t; the path can always drop away at any time. This was always the truth. Maybe this is what they mean by ‘ignorance is bliss’. We would all prefer not to know this. And so we all make a decision. Do we stay frozen by fear or set out on the path again? Slowly, slowly I have crept forward over the last year, testing the ground beneath my feet. Eventually I decided I will never be able to trust it. I also decided that it’s okay. Not trusting it has made me exquisitely aware of the beauty in the every day. I sit here typing, sharing my thoughts with people I will never meet, watching the sun warm up the winter garden. There’s a heavy dew this morning and the light is refracting. When my daughter was tiny we would watch the rainbow sparkles and call them fairies. Today has music and ageing cats and Graham’s sourdough. Today has laundry to fold and firewood and theme music. Later, we’ll head out to lunch with my very adult daughter and her lovely partner to celebrate his birthday. We’ll catch up with his lovely parents and eat great food and laugh. I am grateful for still being alive. I am grateful for all of the people that helped me get here. Whether you’re someone on my medical team that provided primary care, one of the many amazing nurses that supported me or one of the cheerful receptionist that greeted me (never doubt the difference you make). I am grateful to all of the people that contributed to my care and recovery; to the woman at the wig library, to the staff at the local restaurant (Reef) that cheered me on, to the stranger in the waiting room that said “You look great today!” when I had no hair, to the young woman behind the Coles checkout that cried and hugged me. To everyone that smiled and didn’t look away. Thank you. Thanks to all my virtual friends, whether through this blog or Facebook or the BCNA site. Your support and humour has often been a candle in the night. To all of my real world friends, old and new, that hugged me and held my hand and drove me to treatment and took me walking and fed me and loved me. I am truly blessed to have you all in my life. And to those that stepped back or moved away, I wish you every happiness and please know I understand. Special thanks to my yoga teacher, Emma, and my massage therapist, Maryanne. You have both made significant contributions to my physical and emotional recovery. To Mum, for being stronger than I knew you were and for stubbornly refusing to accept the possibility of my death. I love you. To Zoe, for telling cancer where to go and for being my single greatest reason for living. For continuing to study hard and live well when you had every reason to fall in a heap. Mummy’s better now, Sweetheart. I love you more than all the leaves on all the trees. And finally to Graham. I don’t know how I would have coped if this had been you and not me but I couldn’t have done it better. For starting all of this with “You are not your breasts and nothing is more important to me than keeping you alive and if you have to lose them then that’s what we have to do.” For being the only person that could make me laugh when I’d given up on laughing. For helping me to really understand why a good marriage is so much better than being alone. And the next day when they took the binder off to check my wounds and I had horrible tubes sticking out of me with bags attached to collect the fluid and even the thought of it all made me gag, you didn’t leave the room and you didn’t flinch. You’ve never flinched. You’ve grieved and you’ve worried for me but you’ve never looked at me as if I was damaged. I’m just Meg to you. I love you. I didn’t think I could love you more than I did when all this started. I was wrong. I was going to use today to wrap this blog up and say goodbye. I thought it might be time to move on, but I’ve realised that owning the whole experience and integrating it is part of my recovery. It’s healthy to keep hold of the whole experience and to move forward informed by it. Life can be better after cancer. On to the next thing. I am deeply and humbly grateful. Thank you. I was interested to see research reported today that claims the Paleo diet is bad for you. It made me think about how many times researchers have given me dietary advice that was later disproven. At various times in my life, all of the following have been ‘healthy’ or ‘unhealthy’ based on scientific studies: eggs, milk, chocolate, cheese, wine, red meat, fish, butter, margarine, nuts, refined flour, whole grain foods, brown rice, white rice, fruit juice, protein bars, vitamin supplements, not drinking enough water, drinking too much water, chillies, garlic and other alums, tomatoes and other nightshade vegetables, saliva (okay, that last one is a joke). There seems to have been consistent advice on refined sugar but the jury is out of fruit. For goodness sake! My friend Cat gives the best dietary advice; figure out what works for your body. Limit processed food. That’s it. I think it’s great advice because it acknowledges what we all know; what works for us might not be what works for someone else. I’m over scientists telling me what’s ‘healthy’. The trouble with categorising food as either healthy or unhealthy is that it’s misleading. No food all on its own is healthy. Apples will kill you if that’s all you ever eat! Humans need to eat a diverse diet containing a range of different foods. From now on I’m focusing on what’s nutritious and nourishing. My other difficulty with food research is that it’s such a blunt instrument. Red meat was ‘proven’ to be bad for us but the research was done using grain fed, factory farmed meat. It turns out that grass fed meat has a completely different nutritional profile. In particular, the omega 3 and omega 6 balance is way out in grain fed meat and this would explain the research results. Often it’s not just what we eat, but the origin of what we eat that matters. The most common group of human subjects for researchers are college and university students. They like to use young men because then they don’t get the variations caused by female hormonal cycles. I don’t know about you but my diet and lifestyle are about as different to that of an average college student as chalk is to biodynamic, ethically farmed cheese. Even when researchers use a community based control group I know that the kind of variation I can see in the crowd at the local shopping centre means that very few of the subjects are going to have very much in common with me. So I’m taking Cat’s advice and focusing on what works for my body. Because I garden I have the luxury of wandering around with a basket every afternoon and deciding what’s going into my dinner that night. It’s interesting that some days I really feel like tomatoes and others I want lots of leafy greens. Is this my body telling me what it needs or just a human desire for variety? I don’t know. I don’t subscribe to the notion that a craving equals a need because I sometimes crave sweet things and experience has taught me this is a sure sign that I’m tired rather than desperately in need of a kick in the blood sugar. My best response to a sugar craving is something high in protein and an early night. Because I now fast regularly I’ve become really aware of my reaction to the first thing I eat after fasting. Food with gluten in it makes my tummy bloat. When you’ve got no breasts this is really obvious! I’m eating much less gluten. I’ve also found that fasting seems to have substantially reduced my cravings for sweet things. It’s likely that the gut flora that tricks my brain into wanting sugar has been killed off or significantly reduced by fasting. I really can make it all the way down the biscuit aisle at the supermarket without reaching for the tim tams. This is both surprising and joyful. I know that the way my body looks and feels is a direct consequence of the choices I make. If I gain a few kilos I know why. If I want to drop a few kilos I know how. I recognise that keeping my body at a healthy weight will help me to live a longer, happier life. It seems that’s true for everyone, not just cancer survivors. I also like to consider the broader impact of the choices I make. Organic food isn’t just better for my body, it’s better for the planet. Growing some of my own food means I don’t need to get in a car and drive anywhere to be able to put dinner on the table. Eating more vegetables and less meat makes environmental and dietary sense. This is what works for me. It might not be what works for you. By all means try some of the different diets if they appeal to you but I’d also encourage you to be prepared to abandon them if you’re not feeling great. I love The Fast Diet. I’ve lost loads of excess weight, re-established a healthy relationship with food and beaten my cravings. There’s no question that I’m healthy because of it and the research would suggest that it’s helping me to avoid cancer. But it might make you miserable. If it does, find something that works for you. I usually start the new year with a very clear idea of what my theme is going to be. I wrote about this back at the beginning of January. Usually it comes to me as an obvious choice; last year it was ‘health’. A bit of a no-brainer really. This year I was throwing around ideas about learning, creativity, listening, paying more attention to the people I love…….and while all of these seemed like good ideas, nothing really jumped out at me. When this sort of situation emerges, as it does from time to time, I think it’s best to trust the process and wait. Yes, it can feel a bit drifty for a while but then, as surely as the sun appears to rise, I move towards the place I need to be and it’s suddenly there on the horizon. Creativity; making the time and space for it. If you have the time to watch it I highly recommend it. If not, here’s the short summary. Creativity happens when we make space for it and when we recognise that it’s a particular mode. We have our day to day mode of operating in the real world but to be creative we need to shift into a mode where we are free to explore the new and the unusual. Cleese suggests that it’s worth timetabling this, actually setting aside a half hour or an hour just to see what emerges. Importantly he recommends play as the great generator of creativity. The solemn and the serious are the enemies of creativity. Play frees us of our usual constraining thought patterns and allows the new and unusual to emerge. This was the word I’d been looking for: Play. I’m going to spend more time this year being playful. I’m going to approach everyday things with a sense of play. I’m going to laugh more and play with the people I love for the joy of it, without expectation or purpose, just for the fun of it. Already I’m noticing the difference this single word can make to my day. I was heading out to have lunch with a friend on Monday and before I left the house I reminded myself: Play. My friend is always wonderful company but I suspect I was better company for being so light hearted. I’m inclined to be serious, judgemental, argumentative and stern. It’s almost certainly a hangover from my policing career. I’m likely to be the wet blanket that worries about personal injury or gives you unsolicited advice about leaching chemicals in plastics or oxalic acid in kale. It’s not a lot of fun. It doesn’t make me fun to be around. This year will be about shifting that default setting. I’ve had a couple of years of some very stern and serious stuff. I need a break and so does everyone close to me. Actually, I need a permanent shift towards playfulness. I sometimes wonder if the great joy experienced by new grandparents is partly to do with the fact that babies give you permission to play again. We can make silly noises, pull funny faces and roll about on the floor. Why should we need babies to give ourselves permission to do that? I’ve always balked at those memes that advocate never growing up. To my mind, being a grown up is just about taking responsibility for the consequences of your actions. It doesn’t mean you can’t be joyful or silly or playful. I sometimes wonder if what the authors of these memes are really saying is that we all need a bit more play in our lives. We shouldn’t see it as childish or immature (or perhaps we shouldn’t see ‘childish’ as insulting!). We should consider it one of the great joys of life. When I watch dolphins leaping for the sheer joy of it, or dogs playing tag with each other, or cats wrestling but not hurting each other it occurs to me that play is natural, normal and probably essential. John Cleese suggests that humour and play are the space that make creativity possible. We don’t latch on to the first solution we think of. We don’t rely upon the best known way. Play throws up unusual combinations and possibilities. 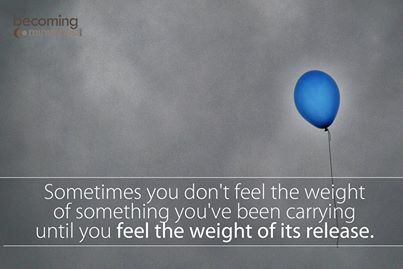 It relieves us of the everyday pressures of life and makes space for something new. I think it’s great advice when approaching any kind of creative pursuit. I like to paint and I know my painting improves when I just let it happen and don’t think about it too much. Start getting too analytical and it all falls apart. I’m going to try intentional playfulness with anything creative to see what happens. I also think that play is worthwhile for its own sake. We should set aside some time to be joyful just to be joyful. If we solve world hunger or invent a better mousetrap in the process then that’s an wonderful product of our play, but I don’t think it should be our goal. Play for the fun of it. Approach ordinary activities with a sense of play. Set aside time to play with people you care about. That’s what I’ll be doing this year. It’s New Year’s Eve and friends are planning everything from full scale public events to quiet nights at home. We’re still not sure what we’re doing but the offer of something in between sounds appealing. A stroll to the waterfront to watch the local fireworks followed by a wander back to a nearby home for the Sydney edition on television. I suppose at some point in the evening, whatever we decide to do, there will be inevitable question about New Year’s resolutions. I don’t usually make them. Research shows that they’re a waste of time and that most people have broken them before the end of January. It’s not that we don’t want to break bad habits, it’s just that it takes more than one commitment on one night every year to do it. I’ve been thinking about successful alternatives to the resolution ritual. I like to pick a theme for the year. Last year (not surprisingly) I chose ‘health’ and I regularly revisited that goal, thinking about how I might incrementally improve on what I’d already done. This works well for me. It’s not a daily obsession. More a thread that runs through the year that I come back to on a regular basis. My beautiful yoga teacher, Emma, held a class today and reminded all of us that in yoga, we make resolutions (or ‘set intentions’) every time we come on to the mat. Yoga also teaches that we should be kind to ourselves and to not push ourselves beyond our intelligent edge. That brought me all the way back to resolutions and the kinds of intentions that are usually behind them. It seems to me that a lot of New Year’s resolutions are a mild form of self-bullying. We hunt for our deficiencies, give ourselves a good talking to and commit to doing better. No wonder we fail. Why does being healthy have to involve attempts to leverage guilt and shame? When did guilt and shame ever reliably motivate us to do anything? What if, instead of beating ourselves up, we saw our new habits and practices as gifts we give ourselves. The key for every new habit I’ve formed has been the joy it gives me. I love yoga, massage, my weekly gratitude posts, my connection to what I value and my commitment to building on my strengths rather than focusing on my weaknesses. I am human and therefore fallible. I don’t always eat as much salad as I would like to, and I sometimes have too much refined or processed food although to be honest, this happens less and less as I become more aware of how unwell it makes me feel, but you see, that’s the critical difference. I’m not carrying around a list of things I’m ‘not allowed’ and calling myself a failure if I eat them. I could eat anything. I choose to eat well most of the time. I’ve even come to enjoy my two fast days every week. Seems crazy, I know, but I enjoy a whole day without cooking and cleaning up afterwards and I love that I’m doing something proactive to prevent cancer from ever coming back. It’s the same with exercise, drinking much less, building good relationships with friends and family, forgiving those that have upset me, doing all of the little things that add up to a joyful and happy life for me. I choose them. I choose them because it took cancer for me to really understand that I am limited, time is limited and this is the only body I will ever have. (Thanks again, cancer). It also took cancer for me to understand that the greatest gift I can give to the people that love me is to take action that contributes to my health and happiness. And that’s all I want from them too. I want them to joyfully make choices that help them to have a healthier life. To give themselves the gift of good health. It’s also what I wish for all of you. Thank you to all of you for continuing to read and share my blog. I got an annual report from WordPress telling me that enough people visited my blog this year to fill three concert halls. That’s amazing! It’s also very humbling. So here’s my wish for everyone this New Year; please consider dispensing with the resolutions and deciding what gifts you might give yourself. You deserve to be healthy. Please shift your focus to being healthier and happier all through 2016 and leave the resolutions alone. It’s been one year since my bilateral mastectomy. It seems like an appropriate time to post an update on my recovery and to reflect on what’s helped, what’s hindered and what needs to happen during the next year. There will be photos, so if you’re squeamish about scars then best skip this one. The short version; I feel great. Lately I’ve actually been feeling well, really well, for the first time since my surgery. I’m amazed by the body’s ability to heal and surprised at how long it’s taking. If you’d asked me just after surgery how long I thought my recovery would take I would have guessed three months or so. Even one whole year later there’s still a little way to go before my body is done. There have been times during the last year when I’ve thought, ‘Is this as good as it gets?’ It seems to me that healing will happen for a while and then there will be a plateau where nothing much changes. I’ve come to think of these plateaus as the body taking a rest from the hard work of healing. The whole experience has been an opportunity for me to take a hard look at my life and my habits. I suspect there are people whose recovery is passive. They wait and hope, trusting that whatever medical treatment they received will do all the work for them. It’s been my long experience that recovery from anything needs to be active. We can support or hinder our recovery with some very simple choices, like what we put in our bodies, how much sleep we get and how much stress we’re prepared to tolerate. I’ve been actively participating in my recovery. I’ve cared for my skin, particularly the site of my surgery, by using a body oil after my shower. I’ve also taken care of lymphatic drainage from my left side by using gentle massage throughout the day. 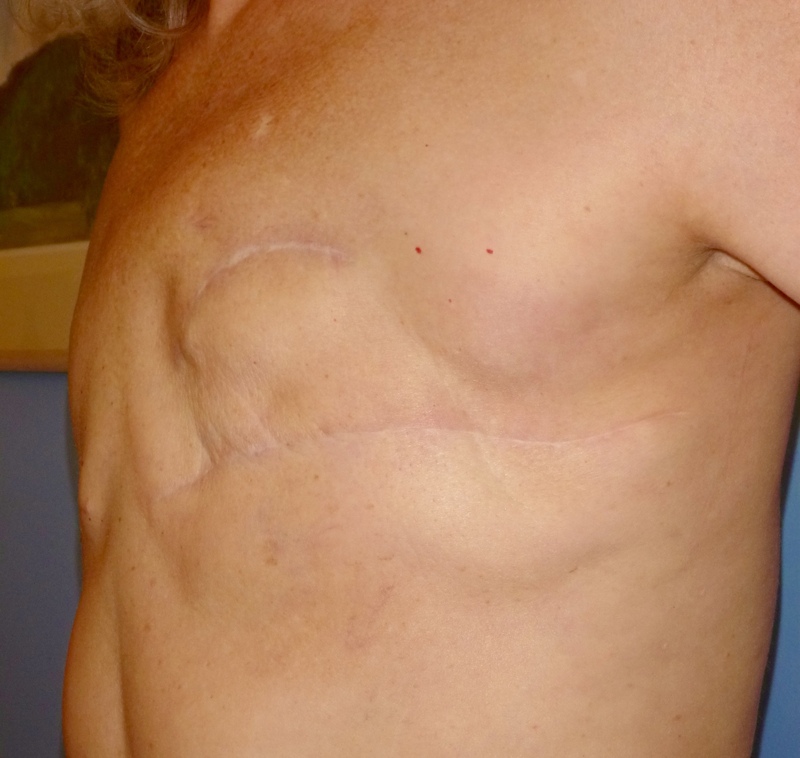 This area has had a lot of damage following three surgeries and radiation. While I haven’t had any signs of lymphodema, I see regular lymph drainage as an important preventative measure. I’ll be doing this for the rest of my life. I’ve lost weight using The Fast Diet. My doctor recommended this because there are statistics showing that excess weight can contribute to breast cancer risk. Fasting also triggers autophagy, the body’s natural mechanism for cleaning up dead and damaged cells. Anyone whose experienced triple negative breast cancer knows that we don’t have any of the new ‘wonder drugs’ available to us. Fasting seems like the best thing I can do to prevent recurrence. I’ll be doing this for the rest of my life. Yoga has probably made the single greatest contribution to my recovery. I do at least one class a week (two when my husband joins me) and I practice at home every day. When I wake up in the morning I get dressed in my yoga gear. I have coffee and check my messages and daily schedule and then it’s straight into yoga before breakfast. I’m able to do things with my body that I couldn’t do before I was diagnosed. Of course the point of yoga is not to twist your body into increasingly difficult poses. Yoga is about integrating the mind, the body, the spirit and the breath. Yoga has helped me to love my post-cancer body and to feel strong and flexible, mentally and physically. I’ll be doing this for the rest of my life. Massage has also been a big part of my recovery. I found a local massage therapist with specialist oncology training. As well as regularly helping me to move back into my own body she’s gently massaged my surgery site and this has greatly assisted in settling all of the nerve pain and helping me to regain sensation in that part of my body. It’s also deeply relaxing. I was eating fairly well before diagnosis and treatment has been an opportunity to review what goes on my plate. We’re shifting towards more and more vegetarian meals. I rarely eat gluten any more and I feel better for it. I’m naturally eating less food thanks to The Fast Diet and the impact on my appetite. We’ve adopted the SLOW principles as much as possible; Seasonal, Local, Organic, Wholefoods. I’m eating much less sugar and finding that I can’t eat anything really sweet anymore. I suspect this is because fasting has killed off the gut bacteria that trick my brain into wanting more sugar. The recent discoveries in relation to the gut biome continue to fascinate me. I’m sure we’re only just beginning to understand how important this work is for our future health. It’s certainly a strong motivator to avoid processed foods with all their additives and preservatives that prevent bacterial growth. Thanks to a couple of visits with a psychologist with ACT (Acceptance Commitment Therapy) training and Russ Harris’s books on the subject, I’m now very clear about what’s important to me, what I value and what I want my life to stand for. To celebrate my one year anniversary I’ve enrolled in a permaculture course. There are those that would argue I don’t need this training because I’ve been practicing permaculture all of my adult life. My friend Cecilia challenged me to ‘become a world famous permaculture teacher’ which is what motivated me to finally enrol. She’s clever. I don’t really need to become famous (nor do I want to) but I really do want to teach the skills I’ve been practicing for so many years. Permaculture is simply the best way to be human and the map for the survival of our species. One of my favourite quotes has always been ‘Be the change you want in the world’. When I was a teenager I looked at a photograph of the planet from space showing all of the lights of civilisation and spontaneously thought ‘human cancer’. I was distressed by the damage we were doing to the planet and a sense of helplessness. For me, permaculture holds the key to healing humanity’s cancerous impact on the planet. It’s probably going to keep me well too. So here’s my latest photos. As you can see, I’ve come a long way since surgery. My chest has gone from being almost completely numb to almost completely recovering sensation. 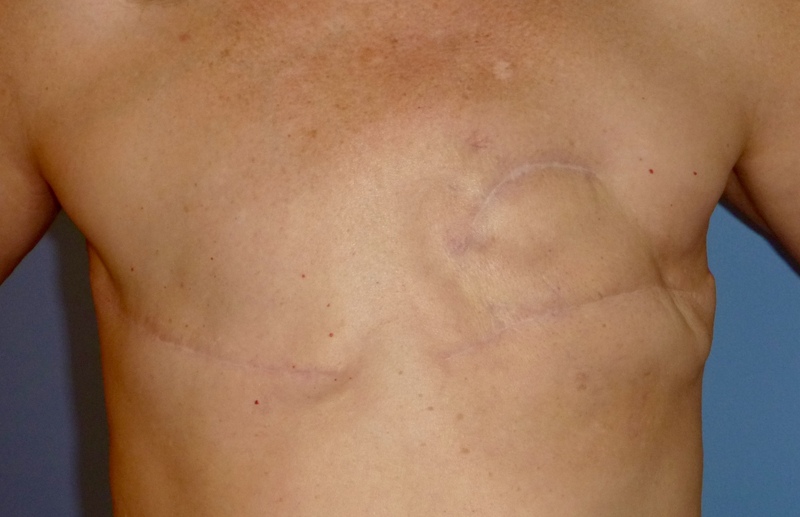 I still have numbness along the scar lines and there’s an area of nerve damage above my original surgery scar (that’s the little arc high on my left side). Nerve damage feels like electricity under the skin. It’s continued to improve with massage and I’m hopeful that it will eventually disappear. My chest still feels a little tight, as if I’ve got a large sticking plaster on it, but this has improved and I believe it will also vanish in time. For most of last year I felt like I was wearing an undersized bra (how ironic) and the tightness extended all the way across my back. That’s resolved now and I only have my chest to deal with. Yoga and massage both help with this. I still need to remember to keep my shoulders back and to hold my body up. 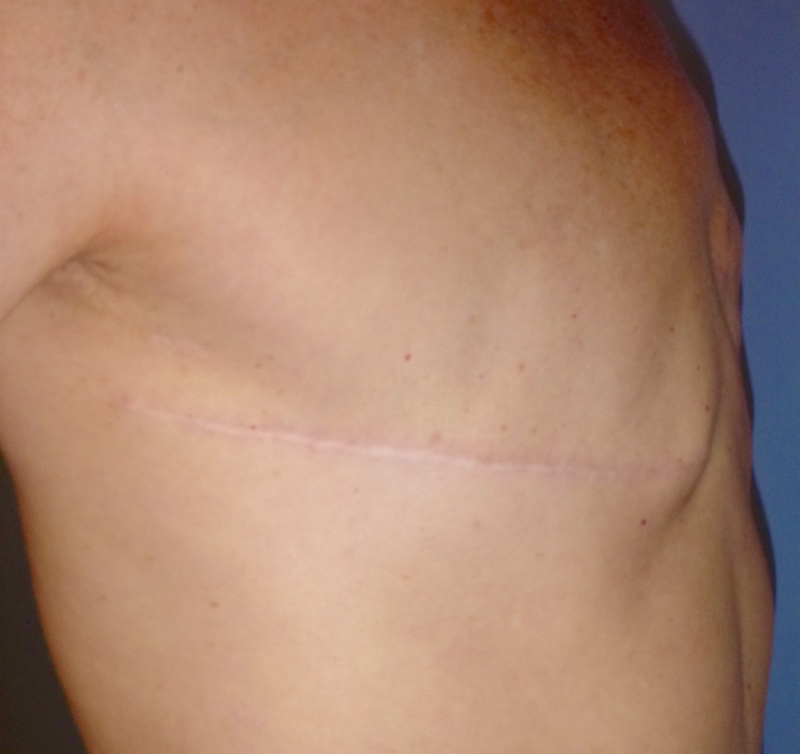 My doctor tells me it’s common for mastectomy patients to develop a stooped back and rounded shoulders. I suspect this is a combination of relieving that sensation of tightness and, perhaps, embarrassment at having no breasts. I regularly roll my shoulders up and back, particularly when I’m at the computer. My neck has taken a while to adjust to the absence of two F cup breasts. Removing close to two kilos of weight left my neck and shoulders in a state of shock and once again, yoga and massage have helped. A friend showed me this neat trick; point your index finger at the sky; now bring your finger so it touches your chin and the tip of your nose; push back until you feel your neck is back in alignment. You can also push your head back firmly into a pillow when you’re in bed, or the head rest when you’re in a car. This simple exercise has had more impact on my neck pain than anything else. As for the other side effects from treatment, I’ve also seen big improvement. I rarely experience any peripheral neuropathy in my feet. I still wake with sore hands but they warm up quickly. I need to be careful with any activity where I hold my hand in the same position for any length of time, such as drawing or sewing. My hands tends to cramp up and become painful. I haven’t given up on my body’s ability to regrow nerves. While one doctor told me I’d probably be stuck with whatever I had at twelve months post chemo, another said it can take six years for nerves to regrow. I’ve already had improvement since my twelve month mark so I’m going with option B.
I have a mild hum in my ears. This is probably also chemo related nerve damage but it could just be age. My Mum has age related hearing loss. It’s important to remember that not everything going on with our bodies is related to treatment. I don’t have that awful metallic taste in my mouth any more and I think this is also a form of peripheral neuropathy. Food tastes wonderful again, particularly straight after fasting. I wonder to what extent the fasting has promoted healing. The science indicates that it should make a difference. In early days, I certainly noticed more rapid healing following a fast. I’ve observed that if I have any kind of skin blemish it’s usually completely healed after fast day. As you can see from the photos, the radiation damage to my skin has greatly improved. As well as the circulatory benefits of massage, I think the regular application of rose hip oil has made a huge difference. As you’ve probably already guessed, my mental state is great. People recovering from mastectomy are, not surprisingly, at high risk of depression. I’m very grateful that the care I’ve received and the work that I’ve done have helped me to avoid that particular complication. In many ways, depression is a worse disease than cancer and certainly at least as deadly. I think avoiding depression has involved a combination of things but particularly the information about ACT, practicing ACT and the benefits of yoga. The most significant contribution to my state of mind has been the love and support I’ve received from so many people. Special mention must go to my beautiful husband who has continued to love and cherish me through all of this. I’m still beautiful to him. It’s an enormous advantage to have someone like that in my life and I grieve for those women that go through this on their own, or whose partners leave them during treatment. I no longer experience ‘chemo brain’. I feel as mentally alert as I ever did. I’m also calmer, happier and less stressed than at any other time in my life. I’m now taking stock and asking ‘What else can I do to continue with my recovery and to improve my health?’ I’ll also be doing this for the rest of my life. I believe that there is no upper limit to how well I can be. To put it another way, no matter how well recovered our bodies seems to be, there is always more we can do to improve our health. Thanks to everyone that’s been following the blog and the accompanying Facebook page. Special thanks to those that have taken the time to let me know that something they’ve read has helped them with their own recovery. You’re the reason I keep writing. Go well. Live well. My best wishes for your continuing recovery. Regular readers will know that I’ve been following The Fast Diet for some time now. Here’s the original post I wrote about it back in January. I’m all for people feeling comfortable in their own skin, whatever their size, and I think the whole diet industry conveniently ignores the data that says it’s your fitness that makes the most difference to your overall longevity, not your weight. I have friends that easily fit a size 14-16 who are very fit and healthy. The problem for those of us with a high risk of breast cancer is that being overweight HAS been conclusively linked to higher risk. Maintaining a healthy weight is one of the best things we can do for our bodies. For those of us in the triple negative category it’s one of the best preventative steps we can take. There are no preventative medications available to us. Enter The Fast Diet. It’s based on good science, it’s become popular all over the planet, and it’s helped me to lose all of the weight I want and to keep it off. I thought it was time to give you all an update on the really surprising things about this way of eating. I tried to limit this to ten things but I couldn’t. Every other diet I’ve ever been on has been hard work. I’d be measuring portions or counting points or keeping diaries or craving ‘forbidden’ foods for months and months. I’d feel deprived and resentful. There are no banned foods on The Fast Diet and you only count calories on two days each week. The rest of the time you just eat a healthy diet with the occasional treat. Truth be told the first two weeks were hard work, but only on the two fast days. By week three it was just my new normal. 2. I can eat pizza! I love pizza. I love melted cheese and crunchy pizza bases and everything that goes with it. I don’t want pizza every night but every so often I really want pizza. No problem. I’ve bought it. I’ve eaten it. I’ve still lost weight. We also love to eat out at fine dining restaurants and cheap, cheerful cafes. No problem. I can see why they call this ‘the foodies diet’. I have still eaten a healthy diet most days of the week but its so wonderful to enjoy good food without worrying about my weight. 3. I can’t eat pizza! Well, I can, but I can’t finish it. One of the surprising things about this diet is that my appetite has been reduced on all seven days of the week. I’m just not as hungry as I used to be. I don’t know if this is because fasting teaches you that hunger is not life-threatening (and I suspect there’s some part of our lizard brain that makes us panic when we’re hungry), or because our stomach gets smaller and feels fuller with less food. I used to devour a medium sized pizza without a second thought. Now I really want to stop at half that amount. The great thing is that this is a choice. I’m full and I don’t want any more. It’s not because someone else is telling me I can’t have it. Bliss. 4. I don’t crave sugar or bread or biscuits…. I’m one of those people that used to get huge carbohydrate cravings. There’s been some recent research into the gut biome that’s discovered a bacteria that thrives on sugar. It can signal our brains and trick us into thinking we’re hungry, and that, in particular, we are hungry for the food it needs to survive. I suspect fasting either kills or reduces this bacteria. In any case, I no longer get cravings and I actually find myself not wanting sweet things. I know, right! I can walk past a packet of Tim Tams without a second thought. It’s a miracle! I had expected to feel a bit lethargic on fast days and I’ve been really surprised by how energetic I feel. Once again, the first couple of weeks were hard work and I did feel weary. I had a headache and even some low level anxiety. But it passed. Now I find I have so much energy on a fast day that I need to plan to go to the gym or do some heavy work in the garden, or I’ll have trouble getting to sleep. I’m pretty sure the headaches in the first couple of weeks were at least partly due to dehydration. I also suspect that those sugar-eating bacteria were ramping up the chemicals as the fasting killed them off. I’ve realised that we get a good portion of our hydration from the food we eat, so on fast days I need to drink a lot more water. It’s also a great way to deal with hunger. I thought that fasting would mean getting progressively hungrier as the day went on. I’m surprised to find that my hunger hits a peak at around 10.00am and then just hovers there for most of the day. I have a bit of a spike around 3.00pm to 4.00pm and if that’s really bad I’ll eat an apple and deduct those calories from my evening meal. Most of the time a drink of water and something to distract me will see the hunger pass really quickly. If you’ve ever ‘been on a diet’ then you’ve also been off a diet. They’re notorious for making us feel like we’ve failed. I think the key to a lot of weight loss programs is that they get the credit for all the weight you lose and you get the blame for all the weight you don’t. The Fast Diet means eating normally for five days a week and just restricting your calories for two (or some other combination; see below). Unless you’re prone to binging or your diet is always unhealthy then I really think you can just eat normally for five days a week. Your appetite will naturally reduce over time. The best thing for me is that if I ‘come off’ the diet today I can just start my fast again tomorrow. And there’s always next week. I tend to bank fast days if I know I’m going to lunch with friends on a day when I’d usually fast but you can just as easily move the fast to one day later. Once you understand the basic principles of fasting you can adapt it to suit what works best for you. My mum has lost a lot of weight just by eating her breakfast later each day and making sure she has nothing after her dinner. By narrowing the window of time during which she eats she’s effectively fasting each night. I’ve sometimes done two days in a row because the research on the anti-cancer benefits has focused on this type of fasting. Some people prefer to eat most of their calories in the morning and some prefer to eat them at night. Some split them into two meals. The surprising thing is how flexible this style of eating can be and how easily you can adapt it to what works best for you. When you’ve spent a day fasting you really notice how your body reacts to whatever you eat next. I’ve noticed that rice makes me bloated and that too much onion gives me heartburn. Because my hunger has been significantly reduced, I’m paying a lot more attention to making sure the food I do eat is nutritious. I’m back in touch with my body. It’s a good feeling. My eyes look bright and my hair is thick and shiny. Usually when you’re my age and you lose a lot of weight you expect it to age your face, but my skin looks great and I haven’t gone all wrinkly. I suspect this is because fasting triggers autophagy, the body’s ability to clean up dead and damaged cells. I’ve noticed that cuts and blemishes heal faster on fast days. 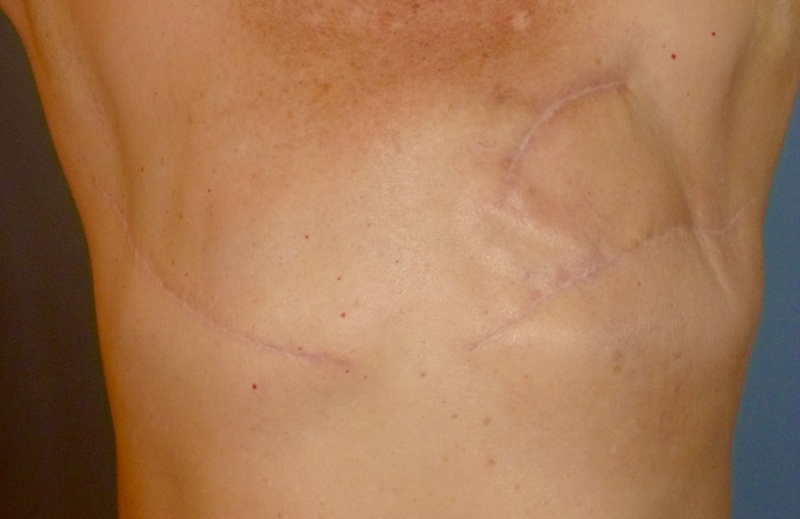 I also noticed big steps forward in the healing of my mastectomy scars. It’s likely that fasting is also helping my body to kill off any potentially cancerous cells. It would be worth doing for that alone, even if I didn’t lose weight. This style of eating is also slightly contagious. Apart from my mum’s weight loss, my husband has also dropped an easy ten kilos, reducing his hereditary risk of heart attack. The single biggest factor that has caused me to come off a diet in the past was the overwhelming sense of misery I felt, even if I lost weight. I once achieved the same weight I am now through Weight Watchers and then sustained it long enough to become a lifetime member. I was resentful of matchbox-sized serves of cheese and palm-sized serves of meat. I spent hours each day calculating points and feeling deprived when I couldn’t eat what I wanted and stay within my limits. I felt cheated by the realisation that the more weight I lost the less points I’d have so the less food I’d be allowed to eat. What’s surprised me about fasting is that I have easily lost weight without feeling deprived and I’ve kept it off. Some days I get to lunch time and realise I haven’t eaten yet. Incredible! I’m much more aware of the difference between thirst and hunger and I’m much more inclined to eat just enough rather than over eating. These are all of the things that Weight Watchers was trying to achieve but without the misery and constant feelings of deprivation. I think some of this has to do with conquering sugar cravings without even trying and the beneficial effects that has on my blood sugar. I also suspect that not having nasty little bacteria messing with my brain helps and I am overjoyed to be at my target weight. But mostly this is about finally breaking out of that cycle of self-bullying, deprivation, anxiety and misery that is traditional dieting. I love food. I love eating good food. I don’t want to spend the rest of my life feeling anxious about what I put in my mouth. I don’t want to look in the mirror and insult myself for not being ‘strong enough’ or ‘committed enough’. The biggest surprise for me has been the way this form of eating has given me a great relationship with food and eating. I’ve lost 16 kilos and I’ve kept it off easily. I’m naturally choosing healthier foods because that’s what I feel like eating. Oh, and did I mention that I’m also reducing my risk of cancer? Meg McGowan on Why Mammograms?